Let our partners become your partners. TransGate provides a local single point of contact to access a comprehensive package of solutions including merchant services, payroll, IT services, website development, and business insurances. 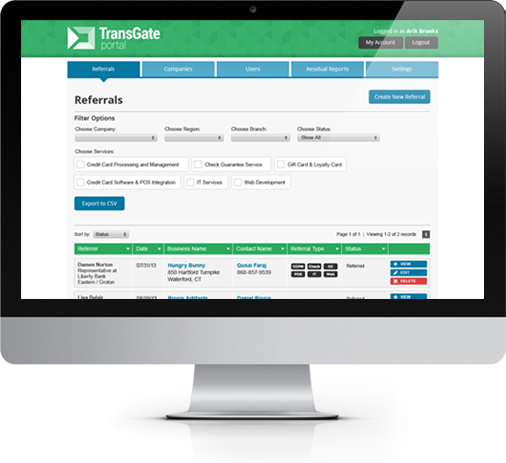 Learn More About the Wide Array of Solutions TransGate Can Offer Your Business. Productive business partnerships and the resulting referrals are the most important asset of any sales organization. Having the ability to transparently share in the realtime tracking and managing of the shared referrals and their revenue is essential and often is the difference between an average sales organzation and an exceptional one. For these reasons we have developed the TransGate Portal.